A chalazion is an inflammatory reaction to trapped oil secretions. It is not caused by bacteria, although the site can be-come infected by bacteria as well. The term chalazion comes from a Greek word meaning a small lump. It refers to a swelling in the eyelid caused by inflammation of one of the small oil producing glands (meibomian glands) located in the upper and lower eyelids. 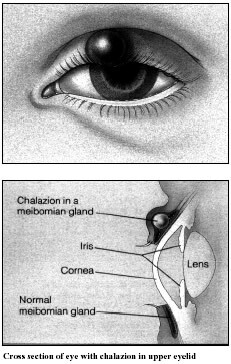 Chalazions tend to occur farther from the edge of the eyelid than styes and tend to “point” toward the inside of the eyelid. Sometimes a chalazion can cause the en-tire eyelid to swell suddenly, but usually there is a definite tender point. maintain adequate heat. The majority of chalazions will disappear within a week. 3. Surgical incision or excision. Large chalazions which do not respond to other treatments can be surgically opened after the early inflammation is reduced. Cross section of eye with chalazion in upper eyelid Chalazions usually respond well to treatment, although some people are prone to recurrences and may require continuing medication. If a chalazion recurs in the same place, your ophthalmologist may suggest a biopsy to rule out more serious problems. Eye disease can occur at any age. Many eye diseases do not cause symptoms until damage has occurred. Since most blindness is preventable if diagnosed and treated early, regular medical examinations by an ophthalmologist are very important.